LEDGlow’s Advanced Million Color ATV LED Light Kit adds extremely vibrant and bright color modes to your ATV. The durable, waterproof Control Box can stand up to whatever punishment your ATV can withstand. 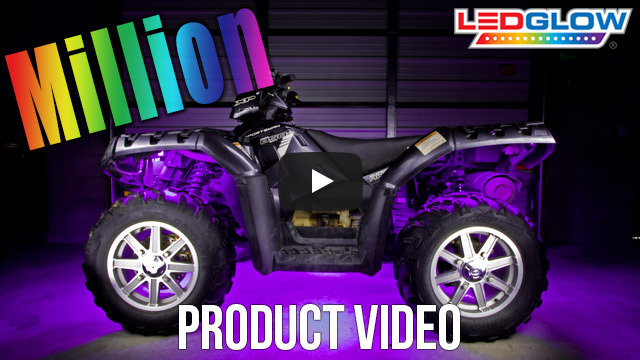 LEDGlow's Advanced Million Color ATV LED Light Kit utilizes ultra-bright, surface mounted RGB LED technology allowing all the included color modes to be extremely vibrant and bright for added visibility and a custom style that is second to none. The featured SMD LEDs are so remarkable that even when looking directly at each flexible strip you cannot see the three separate LEDs that are used to make each individual solid color! Each 6pc-20pc Advanced Million Color ATV Lighting Kit now includes a waterproof control box, (2) 4 button wireless remotes, and all installation and mounting hardware. The included control box offers incredible features that include, 15 solid color modes, 2 color cycle modes, 3 flashing modes, and 1 fading mode. The waterproof control box features a new, unique round design that measures at 1 5/8" in diameter and 5/8" in height making it extremely easy to hide under the seat. Attached to the control box is 18" of wire with a male modular connector that connects to the power harness and 12" of power and ground wires that connect to the battery. The power wire features a waterproof 2 amp inline blade fuse that protects the power circuit of the control box. LEDGlow’s LED lights for ATVs include a one year limited warranty and free lifetime technical support. LEDGlow's Advanced Million Color Wire Extensions easily connect to the power wires on your flexible SMD lighting strips to extend the 4' power wires in 1', 2', 3' or 5' additional lengths. This is perfect for larger ATVs for lighting strips that are being mounted in locations further away from your control box. 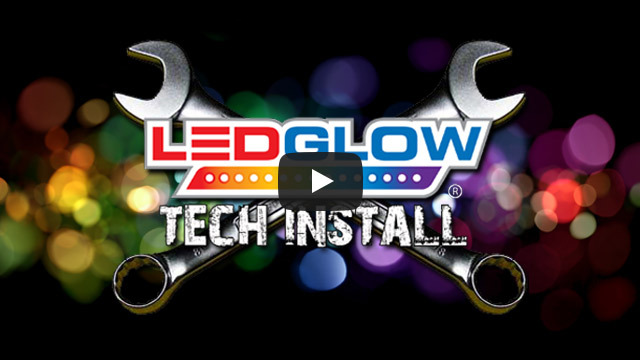 LEDGlow is now offering 3M™ Adhesion Promoter, which is a liquid primer that creates an extra layer of adhesion between the LED strip and the mounting surface your ATV. Using this adhesion promoter is not required for installation, but allows for a much stronger bond than simply installing the light strip with the included 3M™ Tape on the lighting strip. NOTE: 12v BATTERY IS REQUIRED FOR INSTALLING THIS PRODUCT. Great product, good price, easy install. Only think the quality of the double sided tape could be better. Otherwise, great overall review. Bought ten of the million color lights for my 2018 Ranger UTV to compliment my whip light and WOW what a great buy. Easy install with the 5’ extension cables and my buggy is THE bomb! Done a 2017 ranger crew 1000. Put 10 lights on it. It looks great. Very bright. I would recommend these to anyone. They are easy to install. Had a issue with the controller box call the company and they sent a new one. This is the third time I bought from this company. Every time it gets better and better. I installed these in my 2015 Corvette Stingray in the hood and side vents. Looks absolutely amazing. I am buying a second kit for the lower exhaust area and the some interior lights. I bought this kit for my 2016 Sportsman 570 and was surprised at how easily the installation was. The waterproof control module and different size options are what sold me on this kit. The varying sizes makes finding the perfect spot for mounting a breeze and the simple connections make this one of the best kits on the market. Overall, very impressed with this kit and I am positive it will turn some heads!